Life has been rich and wonderful in so many ways, but something that was missing for me was a way to volunteer, a way to give back to the community. I met Erin Anne Beirne of Kiangle Communications through a book project I was working on and she asked me whether I’d be interested in helping with graphic design for the Surrey Foundation (which has transitioned into the new name “SurreyCares”). Erin Anne and her husband Jeff Hector have been dedicated board members for quite a few years with the foundation. I knew nothing about foundations or how they worked, but Erin Anne explained it to me and I will attempt to explain it to you. SurreyCares draws service agencies together to form a community of non-profit organizations and societies for the exchange of ideas, support, energy, and encouragement. They also collect donations to grant out to qualified agencies in Surrey. As the foundation is run by volunteers, at least 98% of the funds raised through SurreyCares are granted back out to the community; SurreyCares does separate fundraising for its costs of operations. I help SurreyCares by doing design as well as heading a team of volunteers who work in the graphic design field. 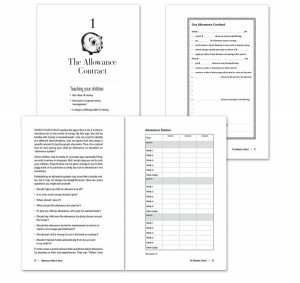 Our design work will supports SurreyCares and their fund raising goals. Last year, after discussion with the Surrey Foundation board and committees, our team had multiple meetings and passed back and forth different concepts as to how we could rebrand the Surrey Foundation to the new name SurreyCares. The previous logo the foundation was using was dated and we decided that we needed to go to a more modern, professional look. Below is the new, redesigned logo for SurreyCares. There was a lot of thought that went into creating this logo. I liked the idea of a ring as it conveys the concept of giving to make a better community, but also how that giving will come back to us through creating a healthier society. People who are helped through difficult times can in turn help others. The colour scheme we used for the logos was based on colours that are being used for the “Smart & Caring Communities” initiative that is going on. The size and colour of the balls in the ring convey the variety of people and needs that are in Surrey, no matter your colour, big or small, we all count for something and can make a difference. We also added the tagline “The Foundation of our Community” because that’s how we see the Surrey Foundation: as something that is for but also supports the community of Surrey. The input and ideas of the team were invaluable and I would like to acknowledge them for their time and effort: Anna Key, Emma Beaty, Fenella Jacquet, Jacqueline Harvey, Sarah Flynn, Kate Quan, Katelynn Bailey, Ksenia Makagonova, Lillian Lee and Paul Beja. I would like to especially thank Jacqueline Harvey, Sarah Flynn, Lillian Lee, Kate Quan and Katelynn Bailey for being there with all their enthusiasm, great ideas and assistance. Our team will continue to help the foundation this year by working on the website, creating print materials to help them meet their fund raising goals. Do you sometimes feel that want to give money directly to a people that have achieved certain goals and to help create a better society? I know that I have, so the possibility to that through SurreyCares is something that I really love. If you have $1000 you can start a fund in your name or anyone person or group’s name. Once that fund reaches a total of $10,000, you can start granting the interest out of the fund yearly in the form of bursaries. As an example, I could start the Perrier Design fund and over a few years my fund has grown to $10,000 dollars. If the interest on that was 3.5% per year, I could begin granting a bursary of $350 per year to a certain college and for whatever purpose I deemed worthy. Possibly I could give the grant to the student with the greatest improvement over the year, but that choice is up to the person or group setting up the fund. If I continued to add to the fund, the amount I could give out would continue to grow. This could be a legacy project for you or a group and once you have raised the money, SurreyCares will manage it for you, ensuring that the funds will always be there and it will be directed to the people you feel need it most. Volunteering through SurreyCares is a meaningful part of my life and helps me feel more connected to my community. Please contact them if you’re interested in be a part of this worthy cause. 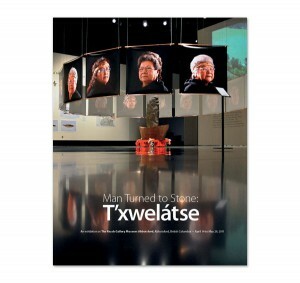 Man Turned to Stone: T’xwelátse brings to life a remarkable story of loss and repatriation. At its heart is a message of collaboration and cooperation between cultures and communities. 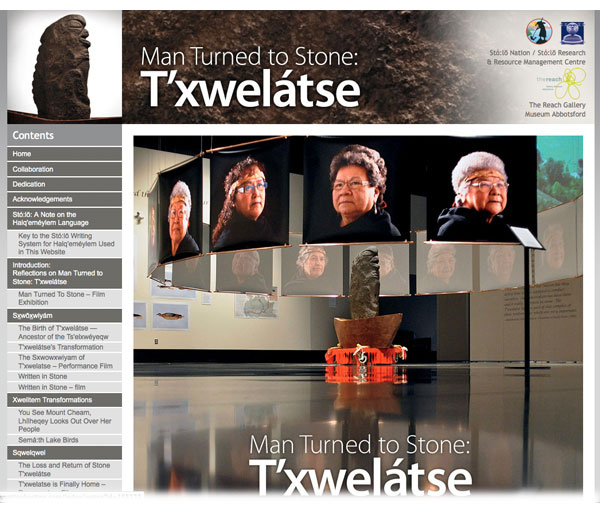 In the spring of 2011, the Reach Gallery Museum Abbotsford in collaboration with the Stó:lo Research & Resource Management Centre, artists David Campion and Sandra Shields created this exhibition that told the story of Stone T’xwelátse. Their was a strong desire on the part of this team to get the information and images from the exhibition out to the public. Through grants provided by Heritage Canada, The Canada Council for the Arts and the British Columbia Arts Council, there were funds to produce a book about the exhibit. 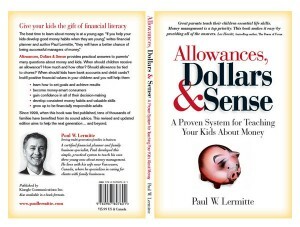 My first role in this project was to help in the designing & printing of the book. It is a 11″ x 14″ paperback (ISBN 978-0-9879661-0-0) and gives you the history behind T’xwelátse and his message which is still pertinent today “We must all learn to live together in a good way”. 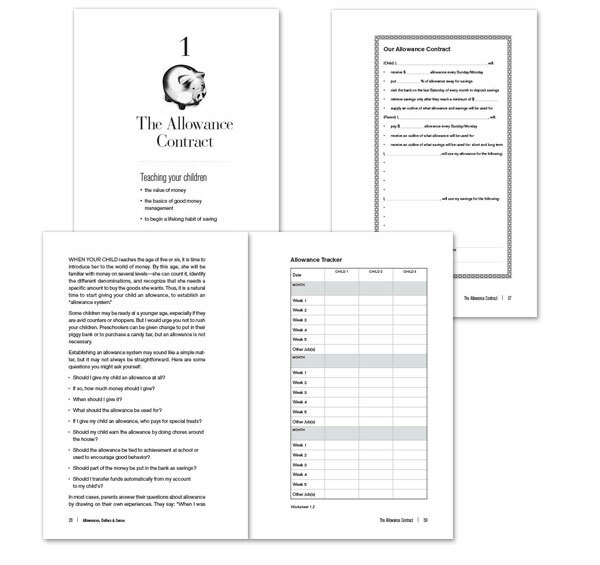 After the book was published, we moved onto designing a website that was basically a mirror image of the book but worked like a virtual book that can be updated as times change and more information becomes available. I have built ebooks, but this is the first time that I’ve turned a book into a website and it was a valuable experience. 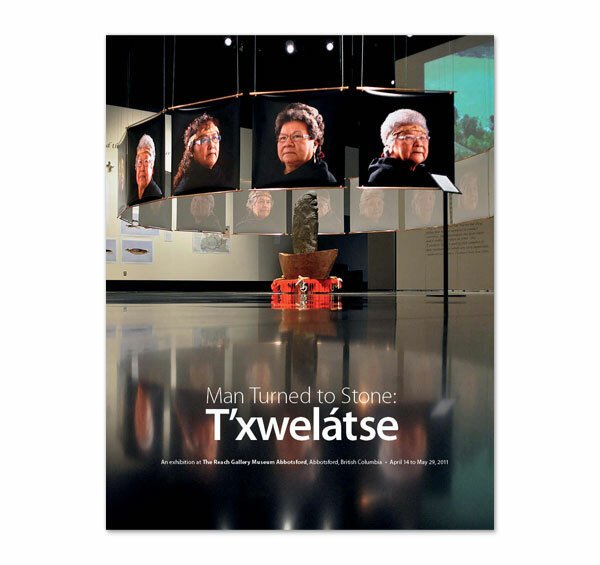 Aside from the text and images included in the book, you’ll also be able to view the film “T’xwelátse Is Finally Home” and more videos that help to convey the history and meaning of T’xwelátse’s story. 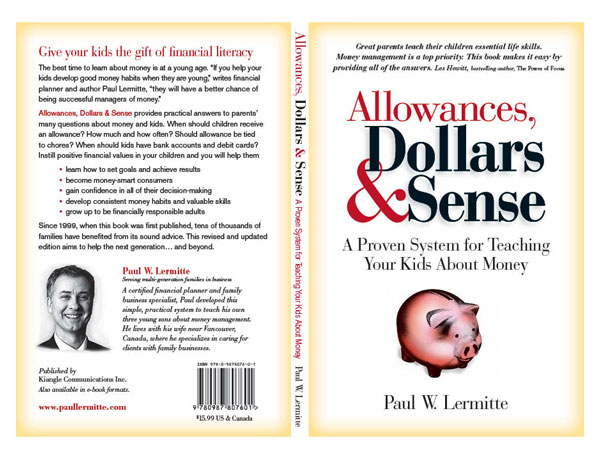 You can download a free copy of the printed book by clicking on this link (25 mb file). There was one more thing to be done to complete the project and that was to do some advertising to let people know about the exhibit, book and the virtual book website. To that end we created a press release, with the writing skills of the talented Naomi Pauls of Papertrail Publishing (who also did the editing on the book). The press release was sent out on August 2, 2012 to the lower mainland BC media as well as aboriginal media across Canada. We also designed and published ads on websites that we thought would give the best exposure to the project. 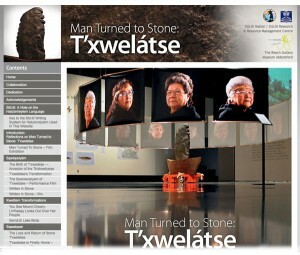 I encourage you to visit the website, to read about “Man Turned to Stone: T’xwelátse” and watch the videos. I can’t think of anywhere else where you could read the story of a man turned to stone, but who is still considered to be a living being. It’s an unique opportunity to learn and explore this fascinating story.